Damages up to 3 enemies in forward facing 45 degree 12m cone. May instantly execute weaker enemies. Capture a random enemies of elite toughness or lower within 30m every second in a murderous grasp, incapacitating them and dealing heavy damage over 4 seconds. Has a chance to instantly kill enemies of standard or lower toughness. Interrupts and stuns the selected target for 3 seconds. Lunge at the selected target and knockback enemies in a 10m radius around them. Reflects all direct single target attacks back to the attacker for <<1>> seconds. 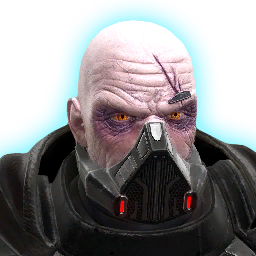 Generates a disturbance in the force which devours the life energy from nearby enemies and returns the damage dealt as health to Malgus and his allies.